One of E. M. Forster’s most celebrated novels, A Room With a View is the story of a young English middle-class girl, Lucy Honeychurch. While vacationing in Italy, Lucy meets and is wooed by two gentlemen, George Emerson and Cecil Vyse. After turning down Cecil Vyse’s marriage proposals twice Lucy finally accepts. Upon hearing of the engagement George protests and confesses his true love for Lucy. Lucy is torn between the choice of marrying Cecil, who is a more socially acceptable mate, and George who she knows will bring her true happiness. A Room With a Viewis a tale of classic human struggles such as the choice between social acceptance or true love. I have not been known to spend my money on particularly pragmatic things. There was an heirloom apple tree native only to New England that I absolutely had to plant in my Midwestern garden. The old-tymey homemade ice cream maker that I vowed to use every summer, which ended up meaning one summer, the very summer I received it, used it, and stored it. But one day, with any extra cash lying about, I would love to sponsor a study at a statistical research institute about love triangles. Mostly about the verisimilitude of love triangles. Walk into a library and select a novel at random, and I’d bet your chances of picking up a book with a love triangle inside hover around 33%. But in real life, not Literature, does the population have a lifetime love triangle percentage of 33%? I doubt it, and yet, in books, those creative factories meant to mimic, comment, and critique “real life” insist on this romantic concept. Love triangles everywhere, love triangles abound! 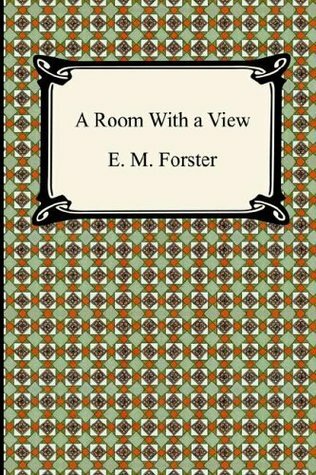 E.M. Forster’s A Room with a View is not an exception. Why does this authorial obsession for love triangles exist? For one thing, it might not be an entirely authorial preoccupation but also readerly: writers can say all they want about Art, but they are almost always just giving us what we want. Love triangles are schematics. An easy way to capture a complex thing. So here, the three-sided polygon between Lucy, George, and Cecil is about the future. Cecil is labeled “medieval” which makes George the “modern” man. It’s up to the woman to decide which way the wind is blowing—forward? Or backward? Cecil can promise her a cloistered life like her mother lived; she will live happily but in the background. Life will unfold like a masterwork painting before her eyes. George can promise very little except for one very big thing: the possibility to step into the painting and become a masterpiece herself. It’s a really clever book and somehow manages to dismantle the manic pixie dreamgirl trope way back in 1908, that is, 97 years before the facile term was coined. So it’s even more impressive in its own historical context. For a good chunk of the novel, I was unsure if I was reading a deeply sexist book or a deeply feminist book. All becomes clear by the end, in fact, if not for the final chapter, this could have entered the annals of feminist literature. Yet I’m surprised to see that some readers sighed over this like a true romance. Forster’s sardonic, detached narrator made such a reading impossible for me. Instead of presenting the facts through Lucy’s loveshocked eyes, he allows us to experience the events at a distance. It is worth noting that this distance is undoubtedly located above: the narrator and reader are above Lucy; we see her faults while she fails to. This choice creates an interesting effect, indeed, an effect at odds with the early feminist message Forster otherwise promotes. Again and again, Lucy says that only women can speak for women and that her thoughts, far from being ideas projected on to her by men, truly exist. Thus her back-and-forth between the two suitors is an attempt to find independence in the midst of a marriage that will undeniably rest upon dependence. She, not a man, will speak for her own hand. But Forster’s superior narrator who suspends us just above the intrigue, dangling like a chandelier in the English parlor at teatime, allows us to observe and share in his judgments (I use “his” because there is no question that Forster’s narrator, mostly an authorial stand-in, is male). The consequence being that even as women exit the Victorian era and claim greater autonomy, even in a novel that celebrates this social change, they remain objects of Art, decorous and meaningful, so long as this meaning is recognized and capitalized by a man. In short, an imperfect, funny little book that undermines itself. When Carry On was announced last year, I couldn’t help but feel a bit extra special. 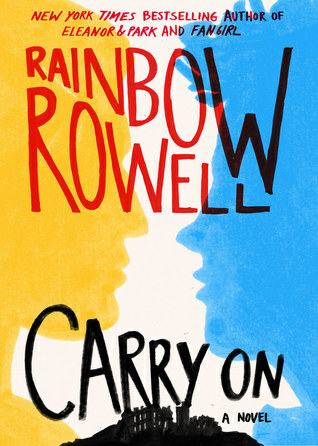 In my review for Fangirl, Rowell’s previous YA novel that featured the novel-within-a-novel that eventually inspired her new novel Carry On (did you get that? ), I requested that she adapt the Simon Snow scenes to a standalone book. Because in Fangirl the Simon Snow scenes were bonkers: a mash-up of Harry Potter with an Edward Cullen-esque vampire thrown in for good measure, topped off by an astonishingly well-developed mythology for seemingly throwaway scenes. So Rainbow wrote it (for me! And I guess the thousands of others who clamored for it), and here I am, deeply downtrodden, because I have to report that this special-order book was not what I wanted. And okay, I immediately recognize that “this book is not what I wanted” is not a valid criticism. Rainbow doesn’t know who I am and she is not writing for me and that is good! Authors tend to shoot themselves in the foot as soon as they write for an audience. But the criticism holds somewhat seeing as Carry On is not Rainbow’s first Simon Snow rodeo. These characters already existed elsewhere; Carry On, as I understood it, would simply be their movement towards center stage. Simon, Baz, Penelope and the gang have not just found the spotlight, however. They are entirely different incarnations of the characters I recall from Fangirl. And in shocking ways too. Originally, Simon and Co. were thick, meaty characters, dripping with turmoil in the face of insurmountable obstacles, but always–always–surmounting them. They managed to shine so brightly despite the fact that their appearances were intermittent and brusque. With more than 500 pages all to themselves in this novel, I expected their stories to develop in more complex and epic ways. Yet faced with so many pages to fill, they deflate to dull versions of their Fangirl selves. Petty problems rule the day; the supreme villain is rarely mentioned. Which I suppose is true in other epic fantasy novels. Harry Potter was not always thinking about Voldemort. For serious swaths of the series, he’s more concerned with Quidditch. But Rainbow Rowell does not have the same advantages JKR had writing Harry Potter. Carry On is as if she started writing the series at Deathly Hallows. There’s so much that happened before, but we don’t see it so the stakes are so much lower. The result is a sham, a house of cards she tries to convince us is an actual house. But the little gusts the pages made as I turned them faster–eager to get to the good bits and finally eager to finish because there were no truly good bits–blew the whole house down. And then I see that Simon and everyone was just paper, thin and lifeless paper.